Fantasy Fantasy games are made to be played with a guide, so get ready to take on every secret dungeon and bring down the imposing Adamantoise with the help of these Final Fantasy XV cheats. The following Final Fantasy XV cheat guide applies to both the PS4 and Xbox One versions of the game. Unlock the Ascension skill that gives you 1 AP every time you kill an enemy with a warp strike. Find a spot with a lot of low-level enemies you can one-shot kill to rack up easy AP. Buy the gighee ham from the shop at Hammerhead. Defeat the bird enemies near Hammerhead to get the daggerquill breast. Find the aegir root near the Vennaugh Haven campground on the way to Galdin Quay. Cook the multi-meat sandwich and tackle quests that grant experience points. Rest at the Galdin Quay inn to maximize your gains. You can also earn easy experience points by crafting spells using coins. Visit the arena in Altissia to bet on fights. When your pick is victorious, you'll win medals you can trade for items. Exchange your medals for the Great Garula Tusk, which you can sell for a paltry 700 gil. This method is slow, but it requires less effort than completing quests since the arena battles play out automatically, so you can do something else as you collect medals. For best results, stick with the higher level combatants. If you keep the shop menu open while driving at night, monsters will not attack your party. After completing the main story, call Umbra to return to the open world. Locate the Formouth Garrison in Leide and drive to it. Bring down the base to earn the "Strange Engine" item. Take the part to Cindy at Hammerhead, and she will upgrade the Regalia so it can fly. To unlock the powerful Legendary Weapons, return to the open world after beating the final boss and locate Randolf the blacksmith in an alley in Lestallum. He'll give you a series of difficult hunts you must complete to earn the materials needed for forging the weapons. To unlock Notcis's most powerful weapon, the Ultima Blade, you must upgrade the Engine Blade three times. Talk to Cid after Chapter 1 to unlock the "Better Engine Blade" series of quest. The first upgrade requires a rusted bit, which is a common enemy drop. Next, you'll have to find a glass gemstone, another common item that can be found near Lestallum. The final upgrade requires a rare sturdy helixhorn from a Duplicorn. 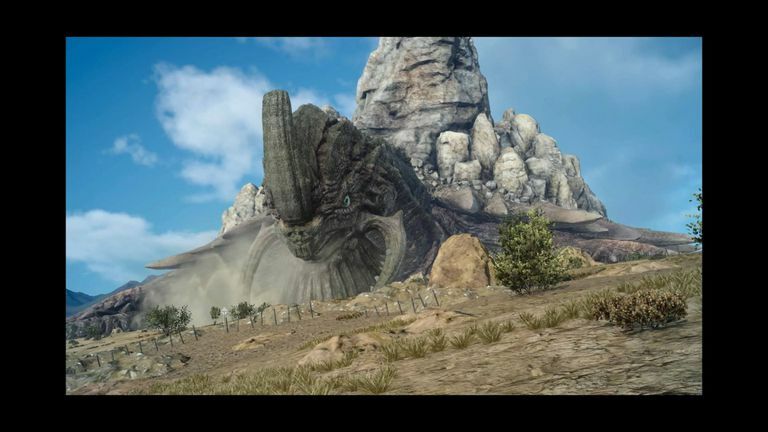 Take on "The Last Spiracorns" hunt in Old Lestallum and travel southwest. When you find your targets, lock-on to a Duplicorn's horn and warp-strike it until it breaks off. The item drop is not guaranteed; you will sometimes get a useless crooked helixhorn instead. Repeat the quest if necessary until you get the required item. Equip the Engine Blade and take the sturdy helixhorn to Cid so he can turn it into the Ultima Blade. Then, travel to the Meldacio Hunter HQ outpost in north Cleigne and talk to the old lady in the chair. She will give you the key that unlocks all eight of the secret dungeons, which will be marked on your map. The enemies inside the secret dungeons are far stronger than the game's final boss, but you can tone down the challenge by lowering the difficulty setting. There is an optional dungeon that can only be accessed with the Regalia Type-F. You must land in the far northwest section of the map. Look for a landing strip north of The Rock of Ravatogh. The Pitioss Ruins has no enemies. Instead, you'll have to rely on your platforming abilities to survive. If you make it to the end, you'll obtain the Black Hood accessory, which allows Noctis to automatically block many attacks. The Adamantoise is the most powerful enemy in the game, and he cannot be encountered until after completing the main story. Return to the open world and talk to Cindy at Hammerhead to unlock the "Let Sleeping Mountains Lie" quest. After completing that quest, talk to the restaurant owner at Hammerheard. Accept the "Lonely Rumblings In Longwythe" monster hunt quest to awaken the Adamantoise. With about 5 million HP, the Adamantoise is the strongest enemy in the game, but he's not necessarily difficult to defeat if you go in prepared. Regardless of how powerful you are, the battle can take close to an hour. Don't bother lowering the difficulty because easy mode won't prevent you from getting crushed. Be at least Level 40. Bring as many health potions, muscle stimulants, and magitek boosters as you can carry. Unlock the Warp Factor II ascension skill. Camp and cook the Golden Tail Soup recipe before going into battle. Focus on the Adamantoise's right paw with warp strikes until he becomes vulnerable, then switch to attacking his eye. Repeat until he falls. After you complete the "Friends of a Feather" quest during Chapter 5 (or earlier), visit the race track southwest of the Chocobo Post in Duscae. Each course has a hidden Chocobo Pear you must find to unlock different colored birds. Hold down the boost button during the countdown just as the 3 disappears to get a head start in races. You can max out each character's special skill early on by exploiting some simple tricks. Buy the upgraded fishing rod and the Great Maiboro lure from the Vesperpool Lake fishing shop. Fish off of the east bank of Vesperpool Lake to find rare and large fish that raise your skill level. Buy 70 luncheon meats from vendors in Lestallum and make 70 Mystery Meat Sushi. You can camp in the same spot over and over again to quickly max out the cooking skill and unlock the best recipes. Prompto takes pictures every 3 minutes when you're walking around, so find a spot with no enemies and strap a rubber band around your controller's analogue stick to make Noctis continuously walk in circles. Use the rubber band trick described above to increase Gladious's survival skill.